Details of the flypast manoeuvres and other event highlights will be revealed in months to come, he added. The RSAF began as the Singapore Air Defence Command in 1968, and was formally inaugurated as the RSAF on April 1, 1975. "What we have achieved so far is possible only with the dedication and commitment of every one of us. Looking forward to the future, we want to inspire the next generation to continue this legacy," said BG Khong. 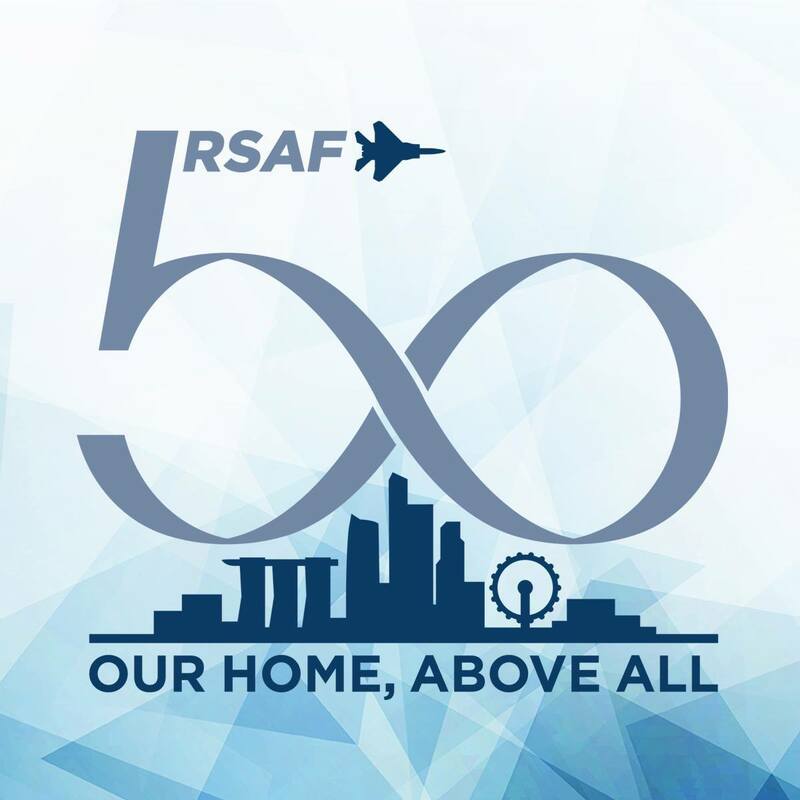 • Aug 11 to 12: RSAF50@ Marina Barrage, with an aerial flypast of more than 20 RSAF flying assets, and aerial displays by the F-15SG and F-16 fighter jets and AH-64D attack helicopters. • Sept 1: Parade with march past and mobile column, and featuring the new Multi-Role Tanker Transport. The guest of honour will be Prime Minister Lee Hsien Loong. Three F-15SG fighter jets soared through the skies in a flypast over Changi yesterday, kicking off the air force's golden jubilee celebrations this year. 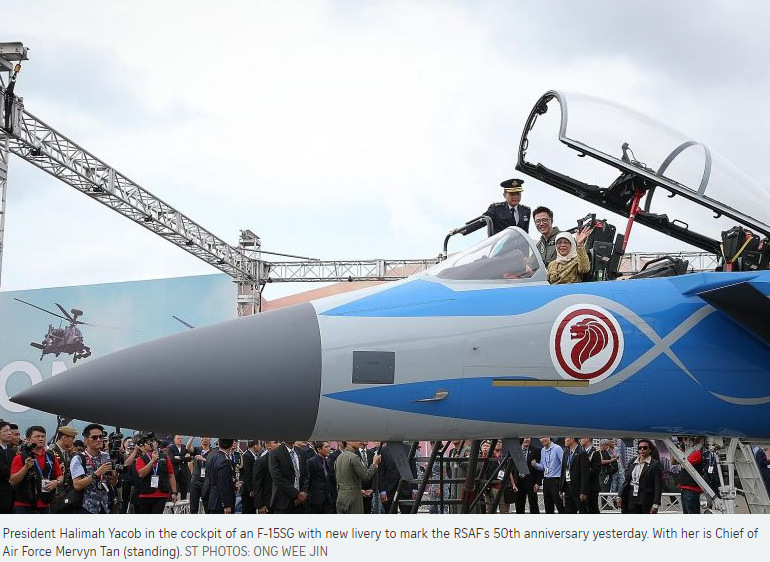 At the launch ceremony at the Singapore Airshow, another F-15SG, part of the Republic of Singapore Air Force's (RSAF) current fighter fleet, was unveiled in the 50th anniversary celebration paint scheme of blue and white, with the RSAF50 logo. 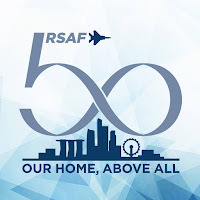 The logo's numeral "50", in the shape of the infinity symbol over the Singapore skyline, is meant to represent how there are no limits to how far the RSAF can go with the continued support of Singaporeans. The flypast was witnessed by President Halimah Yacob and senior military officials, including past air force chiefs. She said in her keynote address: "Together with the army and navy, the RSAF has safeguarded Singapore's sovereignty and provided the stability for Singapore to progress and grow. "Indeed, Singapore's status as a vibrant air and trade hub today is founded upon the security provided by a strong defence force." Madam Halimah also launched a commemorative RSAF50 mural. When completed, it will feature a montage of 50,000 photos from Singaporeans during RSAF50 celebratory events throughout the year. She said that in the case of the RSAF, the challenge in Singapore's early years to build a credible force was even more acute, as the country's limited geography meant airborne threats could arrive at short notice. "In order to keep our skies safe, the RSAF must have early warning capabilities and the ability to counter any threats from the air, round the clock, day and night." Others at the ceremony included Defence Minister Ng Eng Hen, Second Minister for Defence Ong Ye Kung, Chief of Defence Force Perry Lim and foreign dignitaries, some of whom were representatives of countries the RSAF has trained in. Referring to support from friendly air forces over the years, Chief of Air Force Mervyn Tan said: "Our countries remain vulnerable to terrorist threats, such as the 9/11-style attacks. And with an increasing volume of air traffic, this close collaboration between our air forces will be even more critical today to ensure the safety of our skies and the prosperity of all our nations." The air force was formed in September 1968 as the Singapore Air Defence Command. Back then, it had only two Cessna aircraft for basic flight training. It was formally inaugurated as the RSAF on April 1, 1975. Events lined up this year include heartland exhibitions and a flypast over Marina Barrage on National Day Parade weekend. All types of RSAF flying assets will be represented in the flypast. The celebration will culminate in the RSAF50 Parade on Sept 1, to be attended by Prime Minister Lee Hsien Loong. Paying tribute to the air force's pioneers, Major-General Tan said: "They swiftly inducted and operationalised capabilities to defend our skies. They also had a keen eye for the future, building a lasting culture of excellence and robust systems. "Their vision and spirit continue to inspire the men and women of our air force today."